Integral feed control device of new Kason screener regulates the flow of incoming material, eliminating the need for separate feeders. MILLBURN, NJ — A new Kason 3-in-1 System combines a Vibroscreen® vibratory screener, a batch hopper and an integral feed control device that regulates the flow of material into the screener. The system is intended for applications that require screening in batches. The feed control device consists of a circular disc positioned below the flexible connector at the screener's inlet, perpendicular to the flow of material. The diameter of the disc is smaller than the inside diameter of the inlet, forming an annular gap through which material can pass. Because the disc vibrates with the screener lid to which it is affixed, the flow of material through the gap remains uniform. Interchangeable discs in a range of diameters are provided to achieve various feed rates. The screening assembly is suspended on springs that allow it to vibrate freely while minimizing power consumption and preventing vibration transmission to the floor. Beneath the assembly is an imbalanced-weight, gyratory motor that creates multi-plane inertial vibration for the purpose of controlling the flow path of material on screen surfaces, and maximizing the rate at which material passes through the screen. through the screen onto a domed pan and exit through a lower discharge spout. 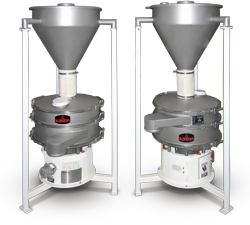 Vibration of the screener is isolated from the rigidly mounted surge hopper and support frame by means of a flexible connector. Vibroscreen vibratory screeners available with the feed control device range in diameter from 18 to 40 in. (460 to 1016 mm) and are offered with single or multiple screening decks, separating particles in one to five predetermined sizes from 2 in. (50 mm) to 500 mesh (25 microns). The screeners are constructed of stainless steel to 3-A, cGMP, USDA, FDA or industrial standards.